I'm not one of those BB drivers who is afraid to push a cap, even though this usually gets me summarily deleted. However, in this game everything came together for me. I came so close to living until the end too. If I could have lasted only 20 seconds more! BB can't push a cap if a DD is there going unspotted or there is an open flank shooting at broadside. Cruiser can't push a cap if a BB is there able to land effective fire or there is an open flank shooting broadside. DD can't push a cap if there is someone to spot it and support able to land effective fire. The problem to me isn't that people don't push caps, but they fail to realize when it is and isn't a good idea to. This for a very long time was my problem. If you watch the replay you will see that I had more to fear from my fellow DDs than I did theirs. There were friendly torps running everywhere! They even continued torping the smoke when it should have been clear that I'd already flushed out the enemy DD and I was myself in it. I guess that might have been one reason the two DDs on my team were pink. I have practiced 1v1 DD versus BB for a single cap several times. The results are not what the average player would expect, BBs win most of the time. That's right, in a 1v1 fighting for 1 cap, the DD usually loses. The key factor is the BB knowing how to WASD all the time. I'm not talking about dodging torps, I'm talking about using WASD periodically to dodge torps that you have not detected yet. in a 1v1 fighting for 1 cap, the DD usually loses. 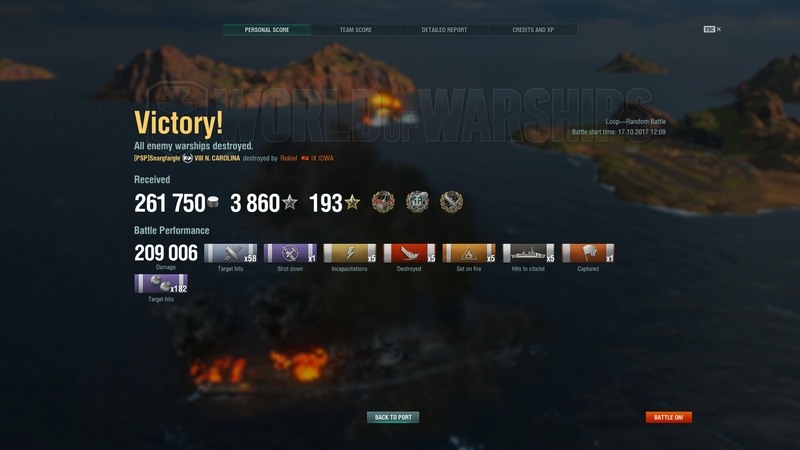 Yet I've seen two BBs and three cruisers held off from a cap by a single DD in smoke, I kid you not. Well yes and no. I, for the most part, can sail right up to a Tier V BB and lower and shive them up close in my Kamikaze. I once did 2 sitting in a base for the win. At the Higher Tiers, no way can you do that. At Tier X, to be caught within secondary range is death. So the higher up the BB line you go you can start to push DD's off the caps. Ding ding ding we have a winner. Once this idea "clicks" with a player they become so much more effective. The balance between keeping good position to kill ships and then capping is a skill most but not all cruisers and BB drivers lack. Great job; it's all about team work and not about selfish play like we see about 80% of the time. DD's seem to hate BB's and cruisers are caught in between; but everybody wins when we all work together and try playing the objective and supporting each other. In that engagement the DD has to give ground and use it's concealment to catch at angles it doesn't expect. Holding the cap is secondary to slowing the advance. If your team doesn't pull it's head out of its [edited], you won't win regardless. What did the flank angle look like? Open space with clear broadside shots vs going broadside to certain torpedos? That scenario is why god invented hydro and radar. Right, @Capt_Mexib, my testing was performed at higher tiers (7+). Additionally, the "run up and torp them" approach is one of the few techniques I have seen that works. It is a gamble, but more successful than dancing at the edge of detectability. I have seen the same thing as well. IMHO there is a large population of players who do not understand how other ship types are played and, thus, do not know how to counter. For example, how many times have you seen people complain about Belfast... The ship has no torpedoes and relies on guns for it's damage. If the Belfast is alone in smoke, RUSH IT!!! Alternatively, torpedo the smoke since Belfast is not a nimble lady. Exactly the point with a BB pushing the cap. Once the BB is near the center of the cap, there is no place for the DD to hide (islands excluded). The result is reversed if it is a standard battle since a delay can equal a win. Well the DD can move to an angle that the BB wouldn't consider him to be and launch torps. If nose in to the DD, you have little choice but to give ground and notify your team of the flanking issue. If that BB has cruiser friends you have to withdraw and wait for help. A BB can't push the DD though if it will take focus fire from people supporting the DD however. In this case, it's suicide for the BB. In this case I kite away and try to pick off the cruises or BB's if outnumbered. You have to first reduce the strength of the opposing force or obtain an advantage over them from a position they can't retaliate from. Hence why smoke is getting nerfed - BB's/Cruisers in smoke with DD screens beat pretty much everything that doesn't have it's own hard counter. DD's that try to hang onto the cap in spite of the situation when it is hopeless are usually the ones who die in the first 2 minutes of a match. Ignore the idiot telling you to get into the cap, he is sitting 20km away and isn't firing his guns. 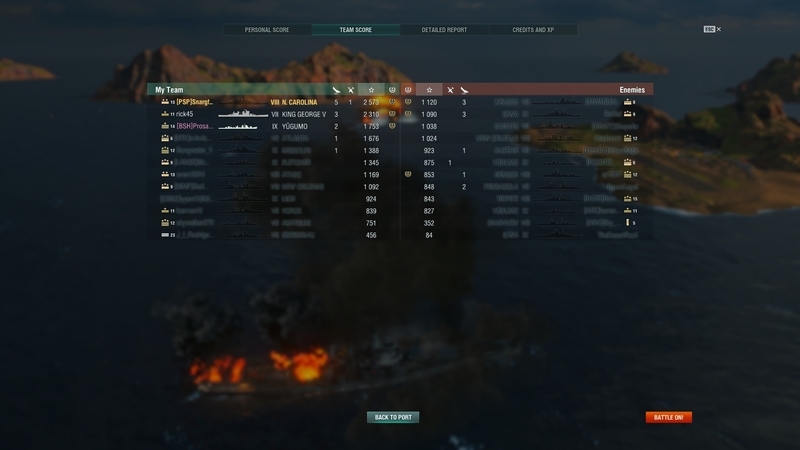 That's either a low tier DD that can't stealth torp or a bad DD player. By high tier the DD can park just outside of detection range and launch a bank of torps to force a turn then score hits with a second bank. My DD play is middling at best and I can do it with high tier DDs. The BB is going to get hit sooner or later and with much worse turn, acceleration, and top speed, it has no way to force the action against the DD unless help comes. Missouri can use radar and the KM BBs can hydro to spot the torps but that's about it. A spotter may help, but more often it doesn't. Without help spotting the DD the BB is either going to get torped and sunk sooner or later or it'll get forced out of the cap just dodging torpedoes. ^This. I really wish more DD players would realize this. It is better to surrender the cap and stay alive. I am a middling DD player (I don't play them often either) but I know from being a cruiser player to have an escape route planned at all times. If a DD is pressing a cap in the beginning the player should know how he is going to extricate himself if the cap is too hotly defended. DDs don't have to do any real damage to rack up points. They just have to stay alive and keep the enemy spotted. Damage on the enemy is just icing on the cake because you get credit for damage your allies inflict while you are spotting them. I really wish the devs would add a real-time counter for that so DD players can see the contribution they are making by keeping themselves alive. I had a 5k+ xp match (with bonuses of course) in Gearing a month ago where I got 1 total gun hit and zero torp hits. I got wrecked trying to push a cap in the beginning and I only had 115hp for the entire match so I could do nothing but spot and launch torps from stealth to force the enemy to dodge. But I kept the enemy spotted the entire time and called down fire on weak targets. That's all I did. I think I got credit for over 100k in damage due to my spotting. The key is that you are playing decent skill DD player versus decent skill BB player. The vast majority of BB players, even at tier X, do not WASD well. Try it, you will be surprised. Some of the best matches I ever played involved 20k damage and controlling the space between my team and the enemy. Good play doesn't always win accolades. Good play has to be its own reward. You and I have a lot in common with our BB driving. I generally find that I am leading a charge..and I generally find that I get deleted. I also sometimes find that golden nugget and have a game like the one you just presented. Great job.. and good for you for keeping the BB drive alive. Someone has to do it.. None of the other pansies will, but they will complain about us no matter what. Only fear I have when I play BB is fear to lose a game.